While there is an ongoing dispute among biblical scholars whether Yahweh, the god of the Old Testament, had a consort, I am moving in the direction of yes. First, it is important to realize that the writers of the Old Testament drew upon existing mythologies for their stories. If you are not able to accept this, then don’t read any further. Scholars attribute the Torah or the first five books of the Old Testament to four oral traditions¾J for Yahweh, E for Elohim, D for the Deuteronomist, and P for Priestly. You might notice that the E version for the name he used for god, Elohim, looks a lot like El, the major god of the Canaanites. There is no dispute that the early Israelites settled in the highlands of Canaan. And yes, Israel has the “el” connotation as well. It probably means “El will rule.” As John Day states in his book, Yahweh and the Gods and Goddess of Canaan, “there are grounds for believing that their depiction of an El religion does at least in part reflect something of pre-monarchical religion, however much it has been overlaid by later accretions.” Of course the Bible you read covered over all these diverse names synchronizing them to god or lord in the English translations. Second, the early Israelite religion was not monotheistic. Yahweh had a heavenly court. “God presides in the great assembly; he renders judgment among the ‘gods.’” (Psalm 82:1) The prophet Micaiah saw “the Lord sitting on his throne with all the multitudes of heaven standing around him on his right and on his left. (1 Kings 22:19). As monotheism developed over several centuries, this body of gods, excluding Yahweh, got demoted to mere angels. Most of the mythologies of this time and place had a pantheon of gods and goddesses. The Canaanites had the gods El and Baal and goddesses Asherah and Anat among others. An interesting story in an older Mesopotamian myth, Enuma Elish, tells of Marduk seeking support from his fellow gods to be named the top god. He agrees to kill the goddess Tiamat if his “bros” go along. They did and he did kill her. Remember that the Israelites were taken as captives to Babylon in 598 BCE when Nebechadnezzar conquered Judah. They must have questioned how their god had not saved them. Maybe they needed to be more monotheistic. Third, the consort of El was Asherah, a Canaanite goddess. While some scholars dispute whether the reference to Asherah in the Old Testament refers to this goddess or to a stylized tree or pole where she was worshipped, there is an interesting passage in Jeremiah that might refer to Asherah or Anat. Fourth, there is a striking similarity to the number of sons of El and of Yahweh. 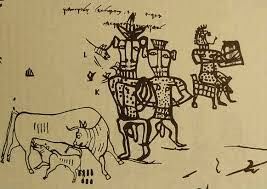 In a cuneiform text found in the city of Ugarit which was destroyed in 1190 BCE, there is a passage about the seventy sons of El and Asherah. It just happens that there were also 70 sons of Yahweh and therefore there were seventy nations. “When the Most High gave the nations their inheritance, when he divided all mankind, he set up boundaries for the peoples according to the number of the sons of Israel. For the Lord’s portion is his people, Jacob his allotted inheritance.” (Deuteronomy 32:8-9). The “sons of Israel” wording in this passage reads “the sons of gods” in earlier versions. This is just too much of a coincidence to ignore. Many other comparisons can be made between earlier mythologies and what became the Jewish faith. Fifth, there are several inscriptions that refer to Yahweh and his wife. An inscription on a pillar in a burial cave at Khirbet el-Qom near Hebron “speaks of Yahweh and ‘his Asherah’ blessing someone called Uryahu and protecting him from his enemies.” Two jars have been found in Kuntillet Ajrud that contain the inscriptions “I bless you by the Yahweh of Samaria and by his Asherah,” and “I bless you by the Yahweh of Teman and by his Asherah.” Israel Finkelstein and Neil Asher Silberman in their book, The Bible Unearthed, state that these inscriptions “apparently refer to the goddess Asherah as being the consort of YHWH.” They also cite a similar statement regarding Yahweh and his Asherah which appears in a late monarchic inscription from the Shephelah of Judah. As with many interpretations of the Bible, there are disagreements. Given the long-standing worship of a female divine that may have started with carved figurines in the Paleolithic and is found in both early and late myths, it would not be unreasonable to assume that Yahweh, like El, had a consort. Obviously, this connection has been obliterated in today’s Judeo-Christian traditions. John Day, Yahweh and the Gods and Goddess of Canaan (London, Sheffield Academic Press, Ltd., 2000), Kindle location 158. John Day, Yahweh and the Gods and Goddess of Canaan (London, Sheffield Academic Press, Ltd., 2000), Kindle location 298. Rosemary Radford Ruether, Goddesses and the Divine Feminine (Berkeley and Los Angeles, CA: University of California Press, 2005), 74. Israel Finkelstein and Neil Asher Silberman, The Bible Unearthed (New York, NY: Simon and Schuster), 242. ExChristian.Net: Did God Have a Wife?